Photo of the Schlafer team at Covelo, Calif., with Paul Shandel on the left, loader operator, Ramon Echeverria, in the center and Antone Schlafer on the right. Schlafer and his small logging crew don’t know the meaning of impossible, and that is one of the keys to his success. Idaho Forest Group (IFG) recently unveiled its new HewSaw SL250 3.4 installation at the 2015 Small Log Conference. in Hauser, Idaho, talks pellets. T-Mar sees the need for a new steep slope cable yarder specifically designed to address the increasing volumes of second-growth timber. Ever since Joel Olson built his first logging road and bought his first three log trucks, innovation and attention to detail have been key to his business. Although most machines are equipped with fire suppression systems, operators can take steps to help prevent fires. A leading coalition of forest owners, wood suppliers, and manufacturers of pulp and paper goods announced the creation of Biomass101.org, a clearinghouse for scientifically sound information on carbon-neutral bioenergy. Biomass101 is an effort jointly produced by the American Forest & Paper Association, American Wood Council, Forest Resources Association, and National Alliance of Forest Owners. “With biomass becoming a more prominent part of the national renewable energy discussion, Americans deserve a conversation that is honest, accurate, and reliable,” said Chuck Fuqua, executive director for Strategic Communications at the American Forest & Paper Association. Biomass101.org will include blog posts, infographics, videos, and other digital media content that corrects false or distorted information in the press. The effort will also have a robust social media presence. “It is essential that leading publications get the basic facts on biomass right to ensure objective analysis. As the hands-on stewards throughout the life cycle of forestry and forest products, we should be a central voice in the discussion and make sure that coverage is accurate and fair-minded,” said Neil A. Ward, vice president of Public Affairs at the Forest Resources Association. In the wake of the death of a skilled choker setter this spring, the Washington State Dept. of L&I sent out this information to help other operations remain safe and injury free. Employees must move away from the turn so as to be above or behind the turn in the clear. They must remain on their feet and face the turn before the go-ahead signal is given. See WAC 296-54-577(5). Employers must provide safety training for each employee. See WAC 296-54-507(1). Failing to be “in-the-clear” is the number one cause of death and serious injury to rigging crew members. To be “in-the-clear,” employees must know what hazards to expect, how unexpected events can trigger hazards, and how to put enough space or barriers between themselves and the likely hazards. Crew members are not “in-the-clear” unless they are out of the swing radius of the longest log in the turn. This means the length of the log, plus the length of the choker and dropline, plus any deflection that could occur. For more information and safety publications, visit the SHARP publications page at www.lni.wa.gov/Safety/Research/Pubs/. 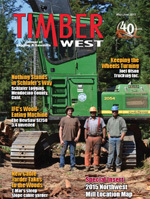 The Idaho Logger reported that in March, U.S. Senator John McCain met with American Loggers Council Executive Director Danny Dructor, Idaho’s Tim Christopherson, and two American Loggers Council Board Members: Dan Leeds from the Northern Arizona Loggers Association and Mark Turner from the Associated Oregon Loggers, both of whom are actively working logging contractors. The senator had asked to meet with the Council and with logging contractors from the West because he is sponsoring legislation to fully fund wildfire suppression while requiring the USFS to conduct proactive forest management to reduce wildfires.